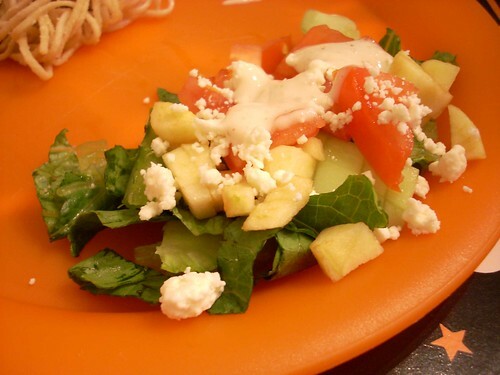 There’s something about the word “salad” that my kids totally hate. I think it must be the “L” in the middle. “L”s are for losers. For a while I tricked them by calling it “leaves and sauce” and they would happily dip their leaves and munch away, one or two leaves per meal, leaving behind any other stuff that happened to stow away on the leaves, stuff like tomatoes and cukes. For a long time I thought they’d grow to love it but it’s been years and if anything they’ve grown more salaphobic. Recently my friend Jill sent me a link to Cynthia Lair’s cooking blog, Cookus Interruptus. I was excited to check it out because Cynthia Lair is the author of my current favorite cook book, Feeding the Whole Family: Cooking with Whole Foods . If you’re trying to make healthy food choices for your family, I beseech you to go out today and buy this book. It is a wealth of information and great recipes. It’s where I learned to cook all kinds of crazy grains and vegetables and a lot of normal ones too in new ways. She’s a teacher at Bastyr University and writes on a very down-to-earth level with a glossary of cooking terms and ingredients in the back of her book that explains what certain sauces and spices look like and where you’d typically find them in the grocery store. LOVE. IT. But I love her new blog even more. Who knew that she was a great chef, teacher, writer and comedian? Seriously the site is awesome. It’s an instructional cooking video blog with humor, great information and fabulous simple recipes. Dan and I have whiled away many minutes (the videos are short) watching Cynthia and her crazy improv comedian “family members” cook up delicious nutritious whole foods, even some of my favorite recipes from her book. After watching one video about picky eaters, I became inspired to invent what I like to call Tiny Salad. It involves dirtying every small bowl in the house but it’s worth it for the amount of vegetables it causes my kids to consume of their own free will and choice. I fill each bowl with a different salad topping chopped very finely, grated carrots, tiny minced tomatoes, minced squash, minced cucumbers, finely shredded lettuce or spinach, minced apple chunks, whatever I have in the produce drawer. 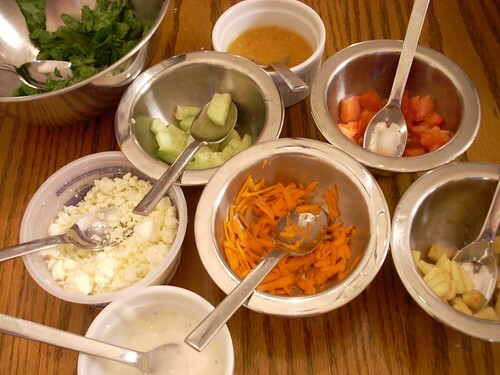 I put little bowls full of “sauce” on the table with spoons in each bowl and let the kids build their own salads. It’s okay. You can say it. It sounds like a glorified salad bar. But it’s not because there’s no sneeze glass, it’s arranged in a bunch, not a line and you can dish your plate while sitting down. The kids love it and make really fun creative salads and — GET THIS — eat them! Check out Cynthia’s blog. I know you’ll like it. Because everyone thinks and feels exactly like me. Because I am a right type of person with a great knowledgeable rightness about me. Oh, and Beth recently wrote about something similar to Tiny Salad called "Fun Bites" but she doesn't put a trademark symbol after the title so you probably don't want to click over there and read about it.